This American Arms hammerless DA revolver is indeed a rarity and embodies a number of unique features that should be considered as sale’s arguments rather than as effective improvements, such as the safety rocker bar that locks the trigger, the small depressible button on the left side of the topstrap that prevents the cylinder from turning when opened for loading, or the small switch on the cover plate, that allows for a two-stage (or SA) trigger working. The safety rocker bar is not new; similar systems can be observed on many handguns all over the world. 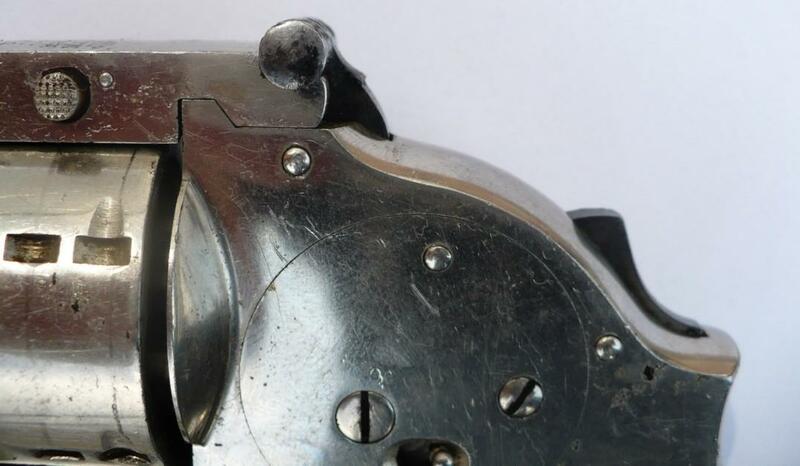 The lock in the topstrap that prevents the cylinder from turning during loading operations, does not really bring anything better whereas it renders the gun more complex and consequently more fragile and more expensive to make. The "hesitation lock" is nothing new either, since it already existed on early so-called "triple action" French Lefaucheux revolvers. The system can provide the user more pleasure at the shooting yard on a quiet Sunday, but it is so sensible and difficult to use that it would be totally useless in a stressy situation, for instance if the user has to defend his life against robber attack or something similar. 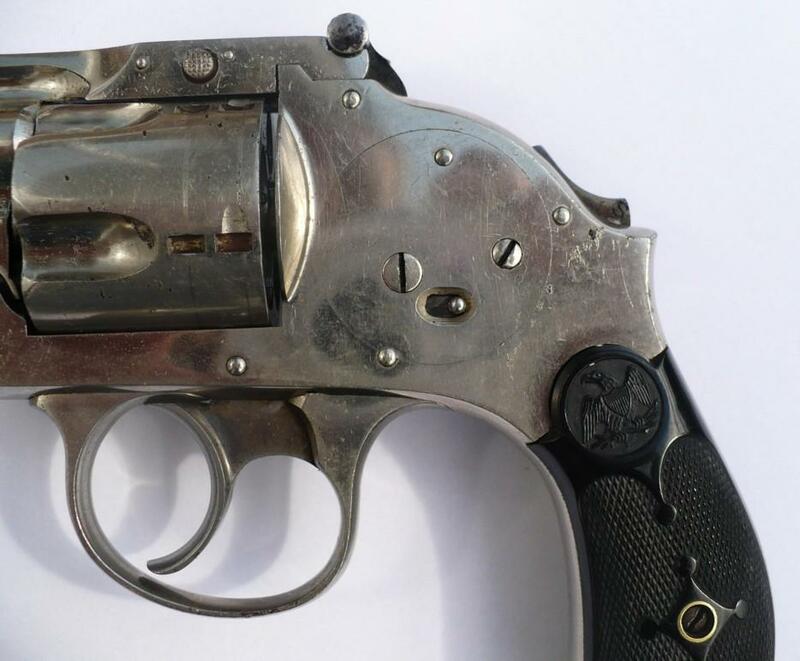 The system can also be compared to the "single action" mode available on the DA Starr percussion revolvers by actuating a small push button on the back of the trigger. The little switch on the cover plate does not actually work on the sear itself; pushing the sear backwards out of the reach of the rigger nose, would prevent any firing. Instead, the switch actuates a flat bar fixed on the inner face of the cover plate and in which a notch is cut. When pushed forward, the switch moves the bar in a position that allows the pin that is visible on the left back side of the hammer, to engage the notch, which will hold the hammer in cocked position and the trigger in a so-called "SA mode". This is however generally quite delicate to operate and requires very sensible fingers. 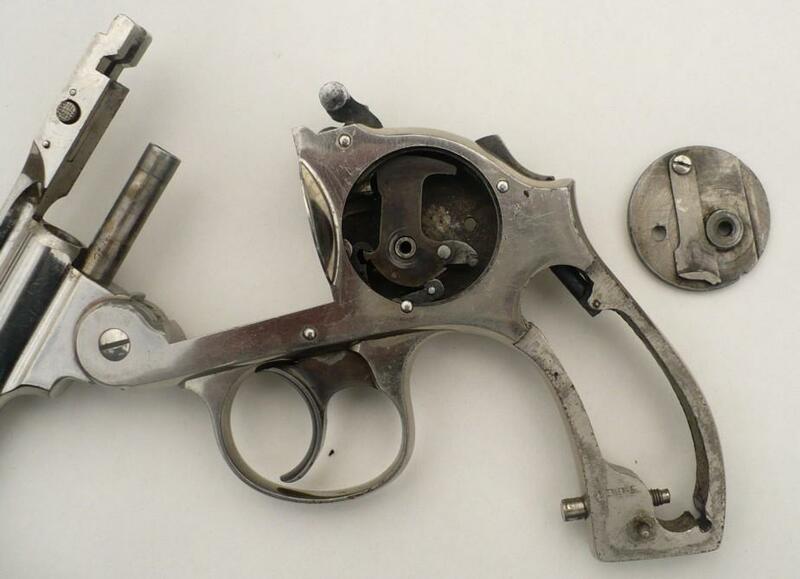 Just like the Triple Actions , the Starr mechanism and many other oddities, the American Arms .38 and .32 topbreaks are one of the numerous attempts to create the "ultimate" handgun by adding special features that did not really improve anything. 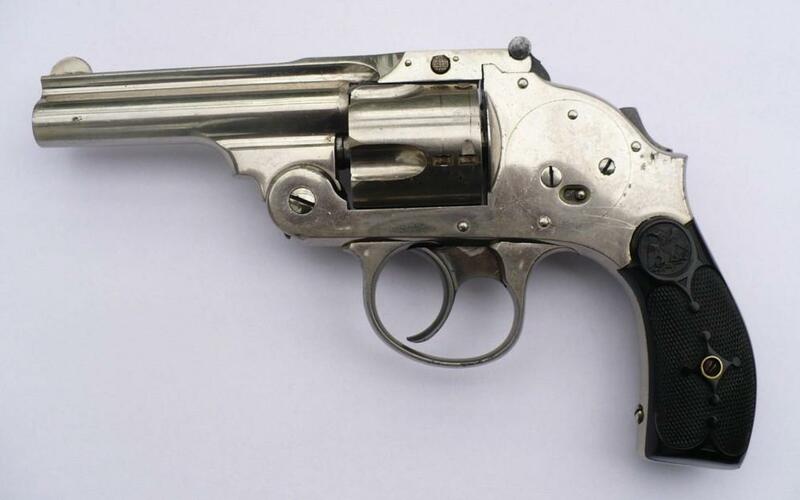 It remains a complex variant of the S&W Lemon Squeezer and Safety Hammerless. Though, its rarity and special features make it a very interesting and still affordable item for today's collectors. Many thanks to "Henk" for the nice pictures. American Arms Co, Boston, Massachussetts. 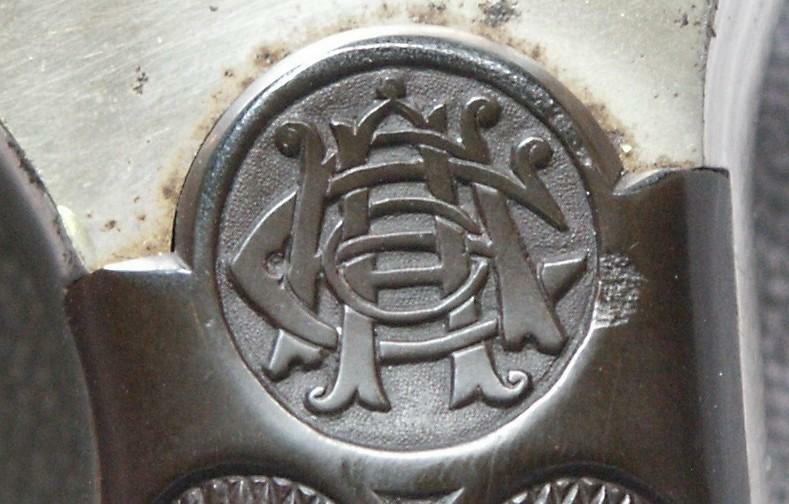 Although bearing the same name as the company that produced the manually revolved double-barrel pistols (also located in Boston), this company is not believed to have any affiliation with them. 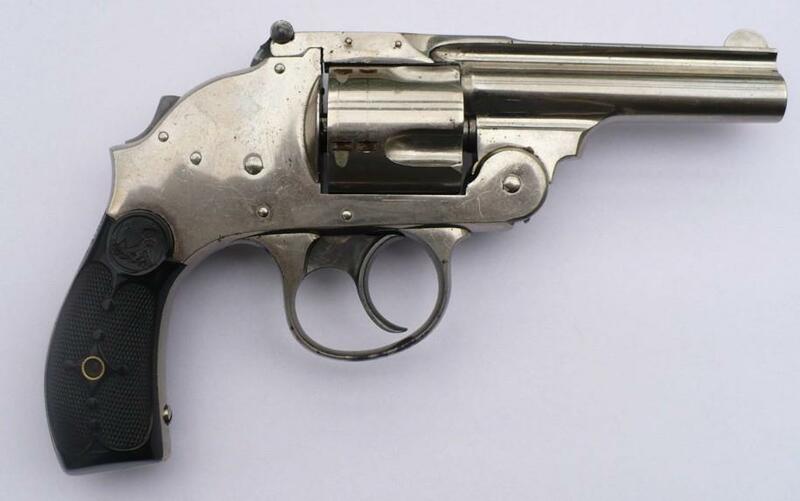 This revolver exists in 2 versions: the one presented, with dpur trigger, was produced in the .38 Centerfire caliber only. The other version has a classical trigger and works in both single and double action, and was made in calibers .38 CF and .32 CF. Total quantity is unknown but estimated several hundreds. Distinguishing feature is the manually operated extractor which appears as a split ring on the back of the cylinder. This system was probably designed to avoid possible lawsuits from S&W for patent infringments. 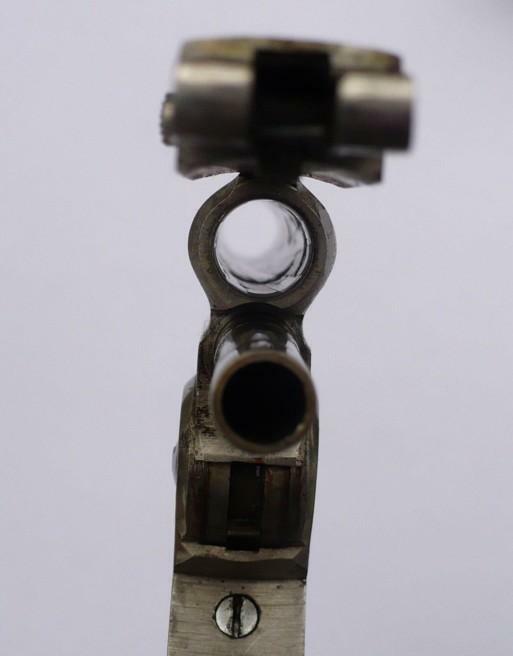 A particular mechanism, safety “S” blocks the trigger of course, but the small sliding round button transforms the weapon into trigger stretcher “triple action”. 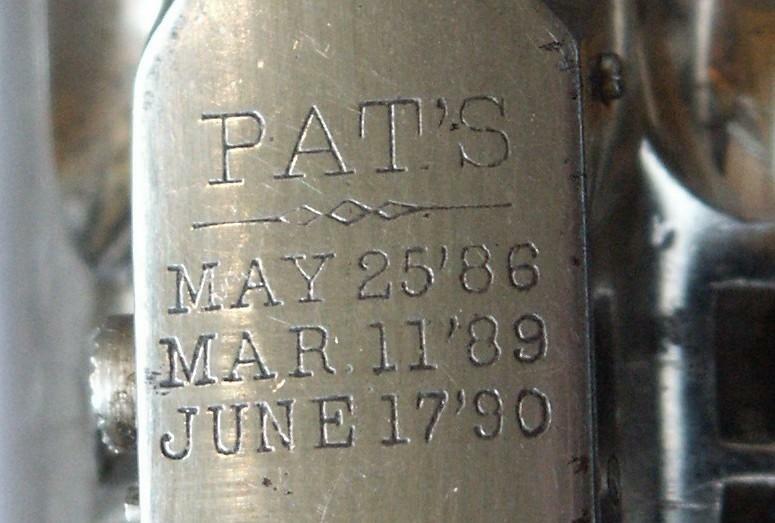 Two different calibers: .22 and .30 annular. Also exist of them 22-22,30-30 and 41-41.